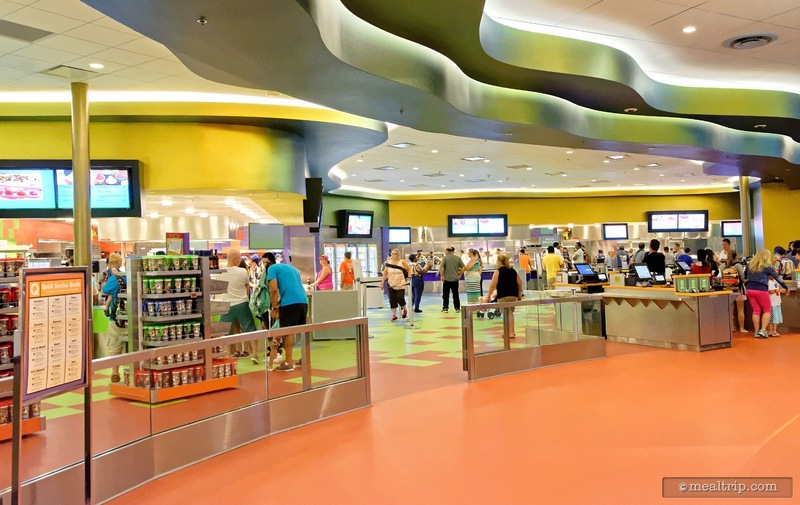 The Landscape of Flavors dining area is the Art of Animation's main and only restaurant. Fortunately, the food-court style location is very large and has ample seating for everyone. The many indoor seating areas are loosely themed with prints from the same animations that the resort is themed with. There is a Lion King seating area for example, with large prints of various art and scenes from the movie. There is also some outdoor seating available, for those that were just in the pool and don't want to be in the air conditioning. 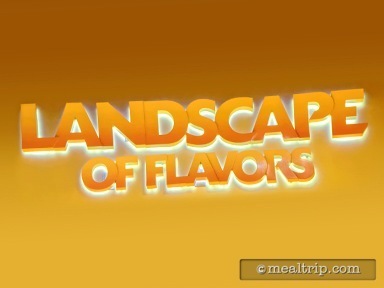 There is a gift shop between the main lobby area and the front entrance of the restaurant, but there is a dimly lit "Landscape of Flavors" sign in the gift shop itself, so it's not too hard to find. Breakfast at Landscape of Flavors may start between 6am and 7am. We've seen some discrepancies between what's posted online and what is posted in the location itself, so you may want to check with them directly before you go. The food court is very large and everyone should be able to find something to eat in the morning. From healthy and light fare such as a create-your-own-fruit bowl to the standard breakfast platter and make-your-own-omelet station, and everything in between, all the breakfast foods that you would expect to find are represented. There are a couple of unique food items here as well. Chocolate chip pancakes seem to be harder to find around the various resorts these days, but Landscape of Flavors still has them. There is a Breakfast Chicken Burger with Pepper Jack Cheese and a Green Chili Omelet on the burger, and a "Steak" and Eggs Burger featuring a Fried Egg and Cheddar Cheese, that are standouts (if you feel like you can eat a burger in the morning). This is one of the few locations you can get an honest to goodness Vegetarian Breakfast Sandwich featuring Naan Bread with Cauliflower, Spinach, and Paneer Cheese. Also unusual is the Challah French Toast. We think in this case the Challah bread is intended to be more a nod to ethnic cuisine rather than holding any religious significance. No matter… it's all good eats.